A bobble head that spins 270 degrees. It resembles a Great Horned Owl with added realism from the hand-painted exterior to frighten garden pests away. Garden Defense Action Owl is a step up improvement in garden defense. The slightest breeze activates the Action Owls head movements. 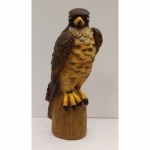 Lightweight and multi-functional, the Garden Defense Falcon mimics that look of a predator to protect fruit and vegetables by scaring off garden pests such as birds, squirrels, mice and other destructive garden visitors. Lightweight, multifunctional garden owl mimics the look of a predator to protect fruit and vegetables by scaring off garden pests. Hang by a string or mount on a pole using the hole in the base. Sonic pulses drive moles and gophers away, consumer value twin pack, covers 15,000 square feet, easy to access battery chamber. 5 year warranty.